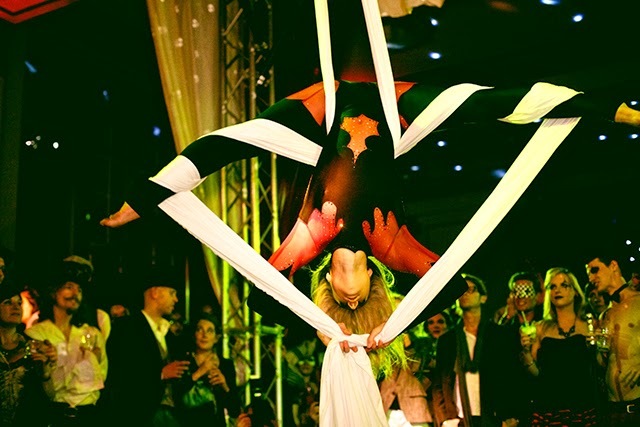 A few weekend's ago Harriet and I went to The Dark Circus Party which was being held at the Bloomsbury Ballroom in London. As our plans were last minute we had limited time to prepare outfits - we wanted to dress up but we didn't want to "overdress". In the end we worked our magic with black velvet, feather boas and exciting head-pieces, (I was lucky enough to be able to borrow the feather boas from work!). 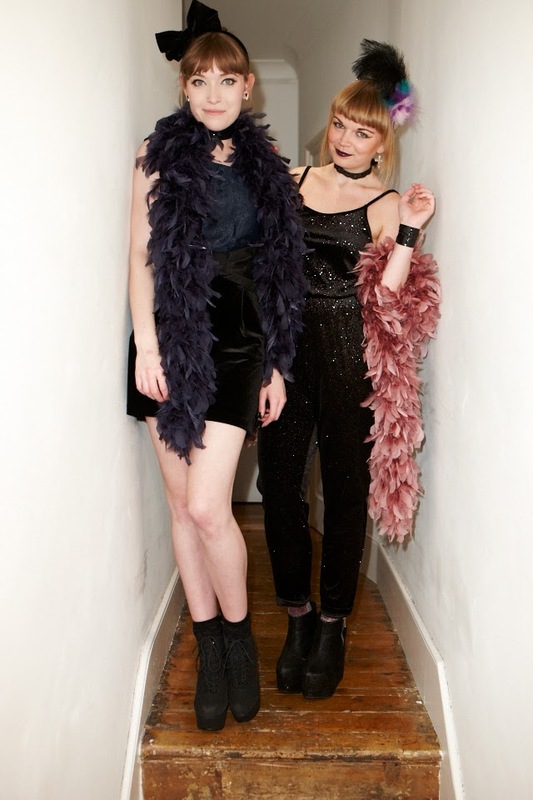 I wore a black and navy playsuit, which my Mum bought for me for Christmas a few years ago, whilst Harriet wore a black, glittery jumpsuit; our outfits were completed with feather boas, headbands and ridiculously high black wedge boots. I added a big bow around my waist for good measure and even wore fake eyelashes, a very rare occurence! Nothing had prepared us for the night ahead - we arrived late, around half midnight I think, because we'd been to a gig beforehand, and we wondered, (or should I say tottered), into the most magical place of dreams! On entering we descended down a large staircase before pushing through a set of double doors into a bar area. 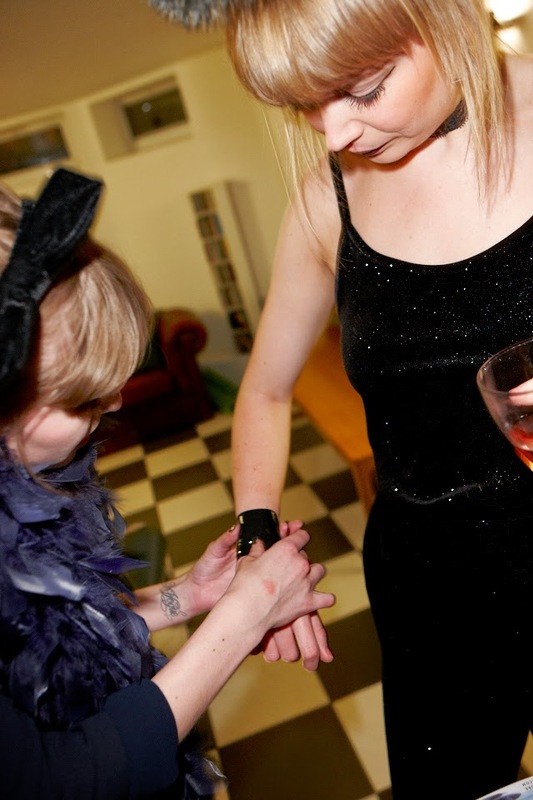 Well, we certainly weren't overdressed…. sequins, stripes, feathers, painted faces and top hats danced before us and we both suddenly felt as though we'd fallen through the pages right into one of "Jay Gatsby's" notorious parties. Double rum and cokes in hands, (the champaign came later), we moved on into the next room where there was dancing, oh the dancing, circus performers and the most fabulous, electro swing music! The rest of the night is a glittery blur, but we had a wonderful time and have already persuaded our housemates to come with us to the next event, which is happening in July - you can buy tickets here. I'd definitely recommend this to anyone who loves dressing up, fantasy and theatrics.